"Drought, and the conservation strategies that are often enacted in response to it, both likely limit the role reuse may play in improving local water supply reliability," wrote Quynh K. Tran, a UCR Ph.D. student in chemical and environmental engineering; David Jassby, associate professor of chemical and environmental engineering; and Kurt Schwabe, professor of environmental economics and policy. In the past, recycled water was only applied to areas such as low-value crops and median strips, Schwabe said. Recently, however, it has been considered safe to drink provided it either undergoes multiple rounds of treatment to remove concentrations of salts, nutrients, and other contaminants, or is injected into the ground and pumped back out later. The United States reuses between 10 percent and 15 percent of its wastewater. In regions like Southern California, where effluent flows from inland communities down the Santa Ana River Basin and toward the coast, indoor residential conservation can limit downstream water supplies. "You often hear it never stops raining at a wastewater treatment plant, meaning the influent from households will continue to flow regardless of whether we're in a drought or not," Schwabe said. "It may be true that it will continue to 'rain,' but the quantity of flow can be severely impacted by drought and indoor conservation efforts, which has implications for the reliability of the system, especially when it comes to downstream or end users of the treated wastewater." 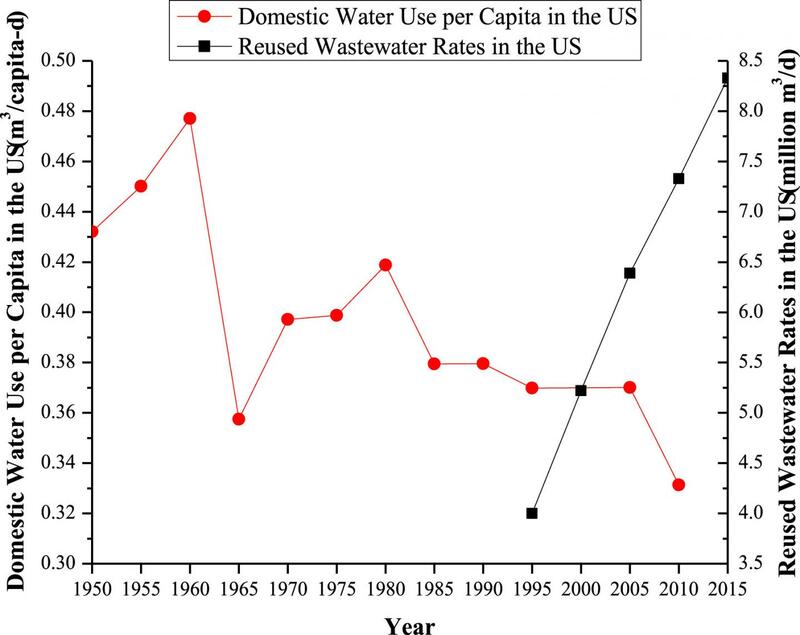 Schwabe added the problem is pervasive in linked systems of wastewater reuse. "If people are taking fewer showers and flushing their toilets less frequently, simple water balance dictates there can be reliability issues surrounding the reuse of water in systems such as those we have in Southern California," he said. Exacerbating the problem, as wastewater flows decrease, their levels of salinity and other pollutants increase. Higher levels of pollutants present significant challenges for treatment facilities that are not typically designed to handle "elevated concentrations of total dissolved solids, nitrogen species, and carbon," according to Tran, Jassby, and Schwabe. However, the researchers said solutions to those problems are available. "Cost-effective blending strategies can be implemented to mitigate the water quality effects, increasing the value of the remaining effluent for reuse, whether it be for surface water augmentation; groundwater replenishment; or irrigation of crops, golf courses, or landscapes," they wrote. To develop an economic model by which wastewater can be treated in a more cost-effective way, thereby increasing its value, the researchers identified feasible wastewater treatment technologies and wastewater treatment trains either in use or available for potential use. A treatment train is a sequence of treatments aimed at meeting a specific standard. "Our solution is based on a system of blending water," Schwabe said. "Traditionally, wastewater facilities have operated by the principle that all the influent is treated to the fullest extent possible. But depending on the sort of demand and regulations a treatment plant confronts for its effluent, managers may have the opportunity to be creative and achieve a much less costly outcome by treating only a portion of the influent with the most advanced technology and blending this with the remaining influent that has been treated but with a less advanced and thus lower-cost process." Schwabe said while this research indicates indoor water conservation may affect the reliability and quality of water reuse during drought, the researchers are not suggesting people engage in less frequent conservation. "These results highlight a central tenet of economics: that there's a cost with every action we take," he said. "Our results are intended to illustrate how different drought mitigation actions are related so agencies can plan, communicate, and coordinate in the most informed and cost-effective manner possible." The research was funded by the United States Department of Agriculture and the Binational Agricultural and Research Development Fund, a U.S.-Israeli partnership. The University of California, Riverside is a doctoral research university, a living laboratory for groundbreaking exploration of issues critical to Inland Southern California, the state and communities around the world. Reflecting California's diverse culture, UCR's enrollment has exceeded 20,500 students. The campus will open a medical school in 2013 and has reached the heart of the Coachella Valley by way of the UCR Palm Desert Graduate Center. The campus has an annual statewide economic impact of more than $1 billion.